Mulch and wood chips provide overlapping applications in the world of gardening and landscaping. Gardeners use these organic and inorganic materials in the cultivation of plant species for the nourishment and protection of garden specimens, among other things. Though the definitions and applications of the pair overlap, mulch and wood chips constitute different things in the world of gardening and landscaping. Beyond gardening parlance, the definitions of wood chips and mulch differ greatly. Purchase both wood chips and mulch at a garden supply store. Technically, mulch constitutes any material placed on the surface of soil around plants. Usually organic, mulch reduces water evaporation, stabilizes soil moisture, helps control weed populations, moderates soil temperature in extreme conditions, controls and prevents erosion and prevents soil compaction. Materials used as mulch vary considerably, and include both organic and inorganic substances. Organic mulches increase microorganism activity in soil, which improves soil quality and lessens compaction. Gardening resources such as the Clemson Cooperative Extension and the Colorado State University Extension point out that mulch lends an aesthetic uniformity to gardens and landscape environments. Myriad types of mulch exist. Organic types of mulch include grass clippings, hay, straw, pine bark, leaves, leaf mold, pine needles, shredded hardwood material, compost, pecan shells, coffee grounds and wood chips. Any organic yard waste serves this purpose. Technically, ground cover plants such as ivy and periwinkle also constitute types of organic mulch. Inorganic mulches include gravel, crushed stone, pebbles, plastic sheeting, rubber, artificial pine needles and landscape or woven ground cloth. As a form of organic mulch, wood chips constitute one of the many options available to gardeners seeking mulch types. The nature of wood chip mulch makes it suited to creating paths through the garden in addition to providing a mulching material. Different types of mulch provide different benefits and drawbacks in the garden. 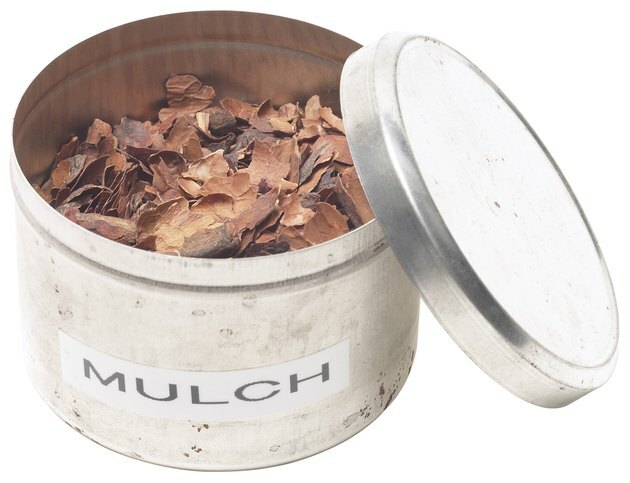 Wood chip mulch, which consists of pieces of ground up wood or bark, proves especially useful with trees, shrubs, perennials and small fruiting species. It increases survival percentages in small trees and helps prevent damage to such plants in areas with heavy rainfalls. A team of horticulturalists with Kansas State University Agricultural Extension recommends applying 2 to 4 inches of wood chip mulch in a diameter of 3 to 6 feet around the base of a plant. The larger the plant, the deeper and wider the area of wood chip mulch required. The exact amount used also depends upon the size of the chips in the mulch. While they comprise one of the many types of organic mulch, the most basic explanation of wood chips defines them as the byproduct of wood chipping, or breaking down bark and wood. Wood chips provide various uses, including bio fuel material for burning and organic mulch. Wood chip mulch may prove dangerous to garden plants if not used properly. When left outdoors in large piles for extended periods, wood chips suffer from a lack of circulating oxygen, or an anaerobic condition, resulting in the production of acids and other harsh compounds. When placed in gardens, particularly in warm weather, these chips can emit harmful vapors that may damage and even kill plants. If your mulch is "sour," then spread it out before adding it to your garden.